This activity can be used with any text. 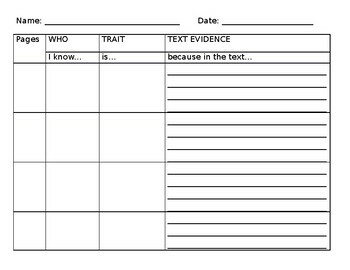 Students have to write the page, character, trait and give evidence (there are 4 rows). There are sentence starters on the top of the columns. The sentence starters help students who need help to complete full sentences and can transfer this to constructed responses. This product is a .docx and can be edited to your needs.